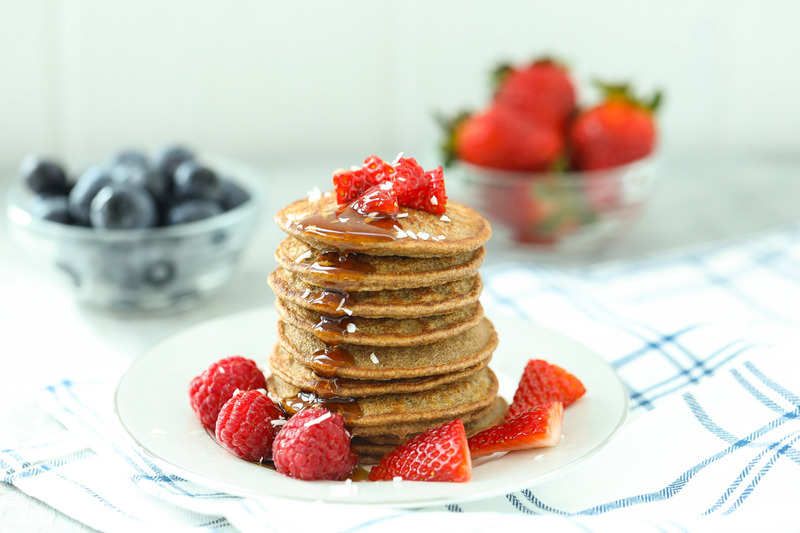 I absolutely love pancakes and really enjoy creating healthier versions of them. 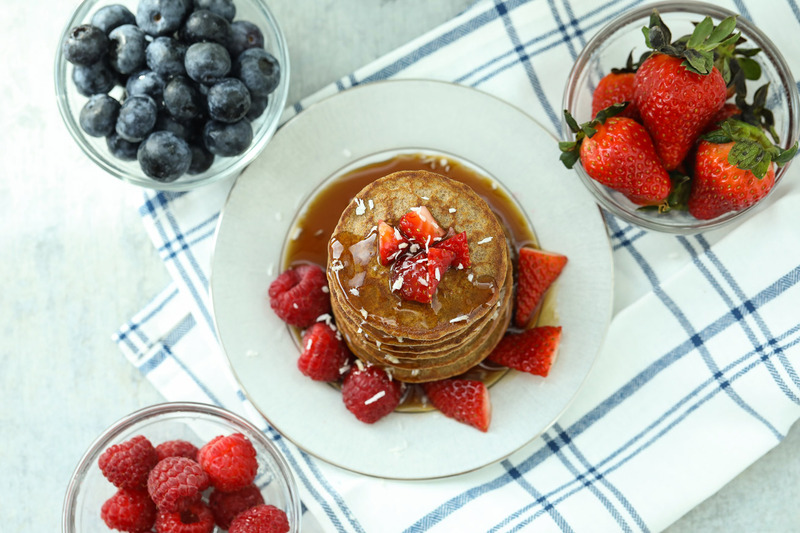 These GG pancakes are perfect for those of you following F-Factor Step 1 and it is one of the recipes I created for the F-Factor x Healthy With Nedi Ebook. I used GG Scandinavian bran crisp crackers in place of flour. All you need to do it pulverize them in a blender and you got a high fiber flour. These pancakes have 24g carb, 16g fiber and only 8g net carbs. The “maple” syrup I use in this recipe is Sukrin fiber gold, which is high in fiber coming in at 28g per two tablespoons. 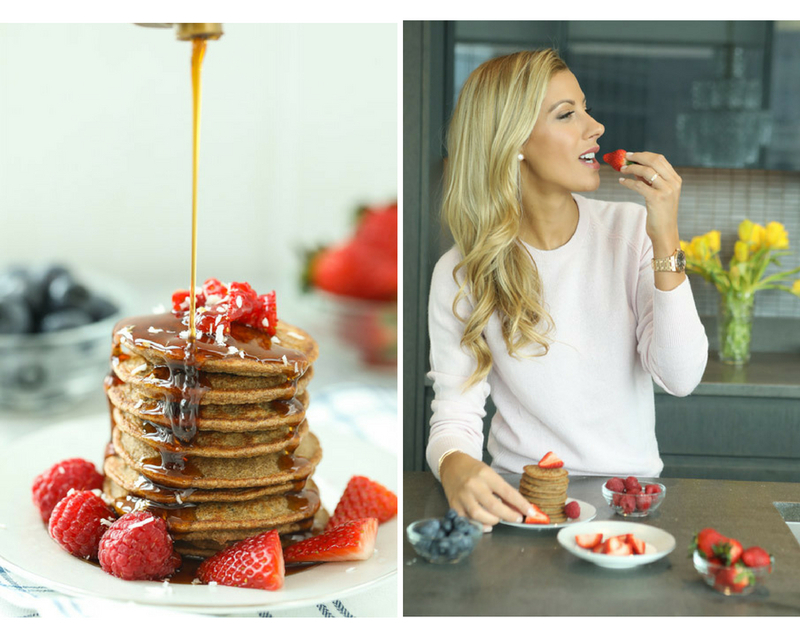 You can now have your pancakes without feeling guilty and still get into a bikini after! Enjoy. STEP 1. Add four GGs to a high powered blender and pulverize until they become like flour consistency. Add the egg, egg whites, vanilla extract, yogurt, and cinnamon. 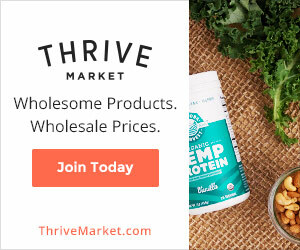 Blend for 2 minutes on high, until well combined. STEP 2. Heat a non stick skillet over medium heat and spray with coconut oil. STEP 3. Pour the batter over the skillet, making 2-3 small pancakes at a time. STEP 4. Top with chocolate chip if desired and cook for 30-60 seconds, then flip. Cook for about 20 seconds on the other side and transfer to plate. They cook super fast so make sure you keep on eye on them and don’t over cook them. Repeat this until the batter is gone. It should make about 8-10 small pancakes. STEP 5. Top the pancakes with berries, fiber syrup and coconut flakes. Hey Neda – any suggestions on how to make these pancakes if you’re vegan?? Hi. Do you think you can use this recipe to make waffles with a waffle iron?